AFRICAN WOMEN IN CINEMA BLOG: "Le dos de la veuve" (the back of the widow), the politically committed documentary by Cameroonian Mary-Noël Niba, critique by Maturin Petsoko. Le dos de la veuve, (the back of the widow), the politically committed documentary by Cameroonian Mary-Noël Niba. Critique by Maturin Petsoko. Journal du Cameroun, 26/04/2012. Translated from French to English by Beti Ellerson. Le dos de la veuve (The Back of the Widow) is the story of two protagonists: Pauline and Patience. The main heroine, Pauline, in her forties, is a mother of six children whose life was devastated by the death of her husband. By the forces of ancestral tradition she is compelled to accept the youngest brother of her deceased husband as the heir to his estate. Moreover, the law accords the successor the conjugal responsibility of the widow. Sexually harassed by the young brother of the deceased, she refuses to capitulate to this child that she has practically raised. Along with her children, she ends up being expelled from the same house that she built. With only moderate means, Pauline stands up against taboos and decides to fight, denouncing the abuse and excesses of this tradition. The two young widows left in destitution, plead their cause before the Fon, the traditional chief. In search of a solution, the customary court vacillates, nonetheless, even while fearing the Koms god, the two women seek justice based on Republican laws. The Back of the Widow brings into view the overwhelming struggle of these women who, though feeling disenfranchised, abused and abandoned by society, have verve and audacity, with a mixture of submission and willpower. One thing is certain: Neither they nor their daughters submit to the customs and traditions that give all the rights to the men. When asked what was the underlying motivation that led her to make such a work, Mary-Noël Niba responded: I want to be the voice of the voiceless. This is the feeling that drove me when I decided to make this documentary; to discover the basis of the tradition of succession among the Koms and their impact on society. Based on a woman's story, I wanted to put under the spotlight, the courage of some of the victims of a form of enslavement of women in the name of tradition; to highlight the women who decided to rebel despite the threats, and to raise their heads as they face the magnitude of the phenomenon. In short, a vision of women who fight with and against tradition…somewhere in Cameroon the death of the “spouse” who forced a woman and her children to live under the yoke of the brother of the deceased husband ... and where the words of the woman is not worth its weight in gold against the tradition. To assert their rights, the application of Western laws is the last resort. Only a year after the official release of the documentary, it was presented at the Festival Regards sur le cinéma du Monde in Rouen in February 2012 and premiered in Yaoundé in 3 March 2012. Screenings were also held in Douala and Bamenda in March 2012. Moreover, it was broadcast on several television channels, such as STV, TV5 Monde (8 March 2012), CFI (2012) etc. In terms of audience responses there was quite a bit of positive feedback. Le Dos de la Veuve is a film to watch again and again. This 68-minute film is a Luman Communications production with original dialogue in English, Pidgin, Kom and French, subtitled in French. Mary-Noël Niba was trained in cinema at the ESRA (school of cinema, sound and film animation) in Paris, received a DEUG (general university studies diploma) in Plastic Arts at the University of Valenciennes and a Masters in Science and Techniques in Sound and Image at the University of Aix in Marseilles. Recruited at the CRTV (Cameroon National Radio and Television) in 1992, she began her career as director of news programs (newscasts and news programs such as Thermomètre and Recto Verso). 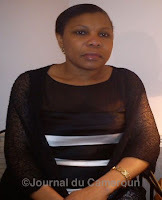 She later created "Le Français Tel Quel", a news magazine about the specificities of French spoken in Cameroon, which made her famous throughout the country. She would later occupy high positions at the television, serving as Deputy Director of Production before taking the strategic post as Deputy Commercial Director of Marketing and Publicity. After working as a consultant in charge of the project "Maisons des Savoirs" with the International Organisation of Francophonie (OIF), Mary-Noel Niba is currently in charge of public relations for the Cameroon Embassy in Paris, parallel to this position she wears the hat of independent filmmaker and executive producer of Luman Communications, a Yaoundé-based production company and film distribution and communications consultancy. Her current project is a feature film entitled "Claire ou l’enfant de l’amour" (Claire or the child of love).